C. Elegans (Caenorhabditis elegans) under a microscope! 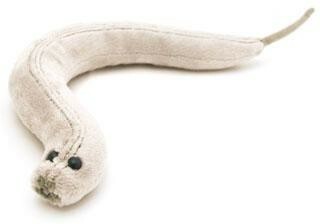 C. elegans is more than just your average worm; it’s the very model of a laboratory organism — and a very elegant gift. Great gift for science enthusiasts! 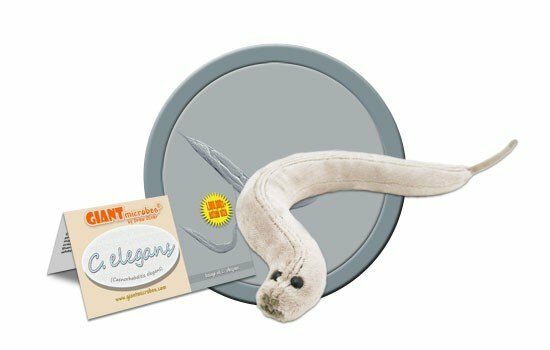 FACTS: C. elegans is no ordinary worm: it’s a small, free-living, non-parasitic, multicellular, unsegmented, eukaryotic, bilaterally-symmetrical, vermiform nematode that is one of the most studied organisms on the planet! Because its cell structure is non-varying from worm to worm, the development of each of its 959 somatic cells has been observed (plus 72 more in the adult male); every one of its 302 neurons has been traced. Its entire 100 million base-pair genome has been sequenced. And because human beings share more than a third of the C. elegans genome, we’ve learned much about ourselves by getting to know it so well. C. elegans is also very fertile. Individual hermaphroditic adults can produce over 300 offspring, and even more progeny after mating with a male. All of which allows for the efficient study of multiple generations of creatures – and with considerably less risk of researcher-subject bonding than can occur with soft, fluffy, doe-eyed, playful, warm, friendly, trusting, white … mice. In 1963, Sydney Brenner introduced the notion that C. elegans was a model organism for studying developmental biology. Since then, it’s been widely used in labs as a popular research tool to study gene expression and cell activity. The genus name derives from Greek roots “caeno”, “rhabditis”, and “elegant”, meaning common rod-like organism with elegant movement. 1 millimeter long, or 250 times smaller than a string of spaghetti! 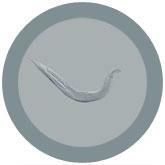 Caenorhabditis elegans are microscopic roundworms that can be found all over the world. They live in the soil and in rotting vegetation, eating bacteria and fungi. They’re non-pathogenic, which means they don’t cause harm to humans or animals. First described in 1900 by Emile Maupas, a French librarian turned zoologist. It has two sexes, hermaphrodites and males. Hermaphrodites can self-fertilize or mate with males, but they cannot reproduce by fertilizing each other. They can produce 300 to 350 offspring with self-fertilization, and even more if it mates with males.